Within the shadow of the capitol of California, the Yolo Bypass offers excellent wildlife viewing opportunities throughout the year. Thousands of migratory waterfowl descend upon this area during the winter months. Shorebirds, ducks and geese fill the skies with a backdrop dominated by the Sacramento skyline. During the summer large numbers of Swainson’s Hawks can be seen foraging on the periphery of the seasonal wetlands. Additionally, you can explore one of nature’s wonders in the Central Valley in July and August! One of the largest colonies of Mexican free-tailed bats in California lives adjacent to the Yolo Bypass Wildlife Area. 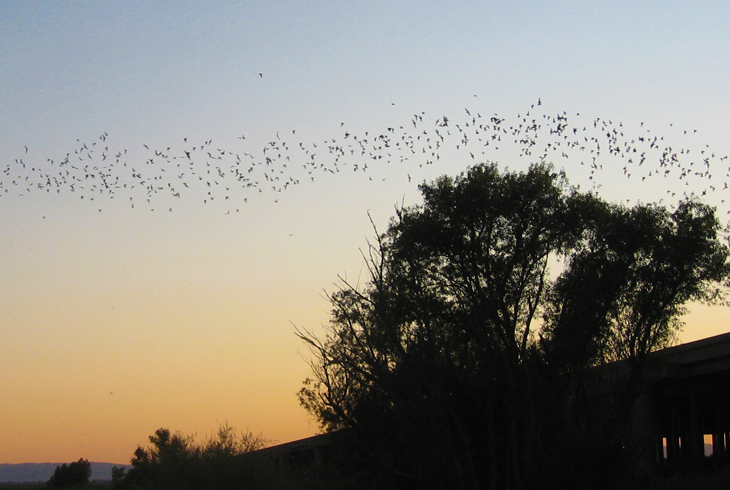 Join one of the regularly scheduled “Bat Talk and Walk” tours offered by the Yolo Basin Foundation to learn about and view these native live bats. Following a 45 minute indoor presentation on bat natural history, you will carpool out to an area of the Yolo Bypass Wildlife Area that is not normally open to the public to watch the colony emerge in large ribbons to hunt insects at sunset. It’s a sight you will long remember! This family-friendly experience takes about 3 hours. Space is limited, with tour dates nearly sold out for the season. Click here to reserve your space. Adults are $10 each, children 16 and under are free.